Great location - just a mile down the beach from Paia town, or a few miles in the opposite direction to Kahului (grocery stores, business center). Kihei is a quick trip across the valley of the island (8 miles). Very small property - only 18 townhomes, and every one faces directly to the ocean. Gorgeous grounds! 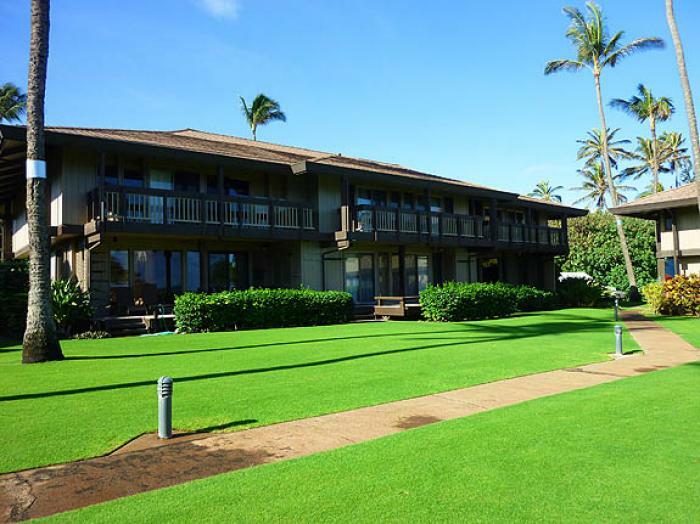 The lawn is like a carpet, and the buildings are surrounded by tropical plants and trees. Pool on grounds - tired of the ocean? Take a dip in the pool. Tennis on grounds - this court is in VERY ROUGH CONDITION, and not suitable for experienced players. Launch access for windsurfing or kiting, fun for paddle boarding, and boogie boarding. Gear storage - each unit has racks to store boards / sails. Gated property to protect your security. Pack the beach toys and take a five minute walk down Paani Place to Baby Beach. Easy parking - there are two dedicated spaces for each unit.